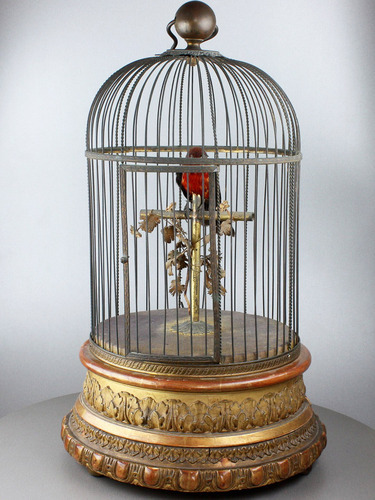 When wound and the start/stop lever actuated, the perched bird which is decorated with pressed silk leaves and flowers, moves naturalistic beak, head and tailfeather, synchronised to the continuous birdsong of good melodic tones, coming to a finish when the start/stop lever is returned to the stop position. 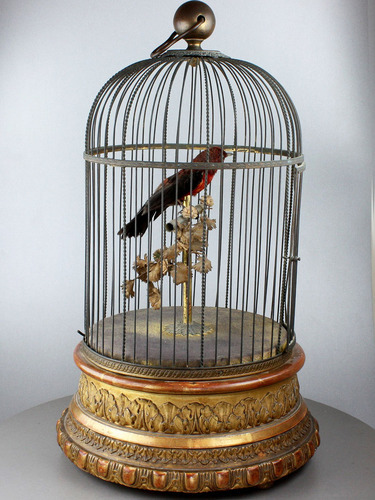 The perched bird with excellent deep red and jet black feathered plumage, black eyes and natural beak, on the T bar perch on superb untouched faded yellow velvet covered base, seen towards the centre as the light mauve backing, under domed circular cage with hoop and boss top, leafed cast detail to the intermediate bands crossing the bars which are arranged with every sixth one being of double twist formation, on the highly desirable gilt gesso wood base of acanthus leaf frieze above smaller leaf moulding and wide egg and dart plinth. 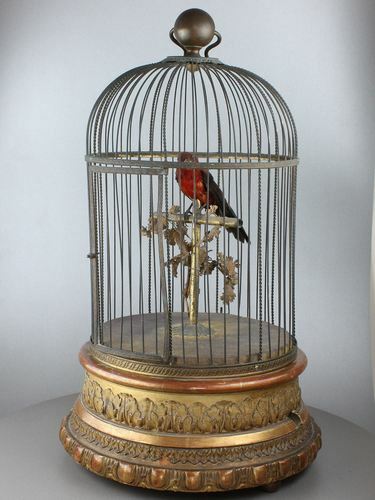 This cage features a bird with a genuine naturalistic look and feel. If your require the look as well and the sound, look no further. 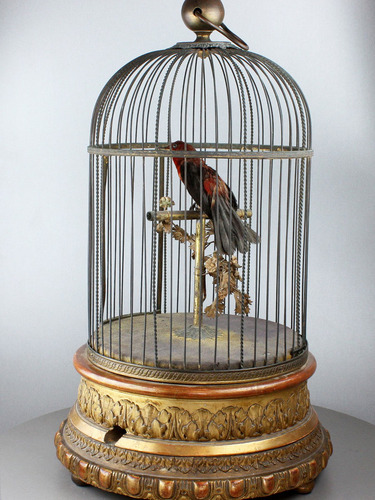 Take a very good look at the gesso base and the feathered bird. Untouched. Kept in check. 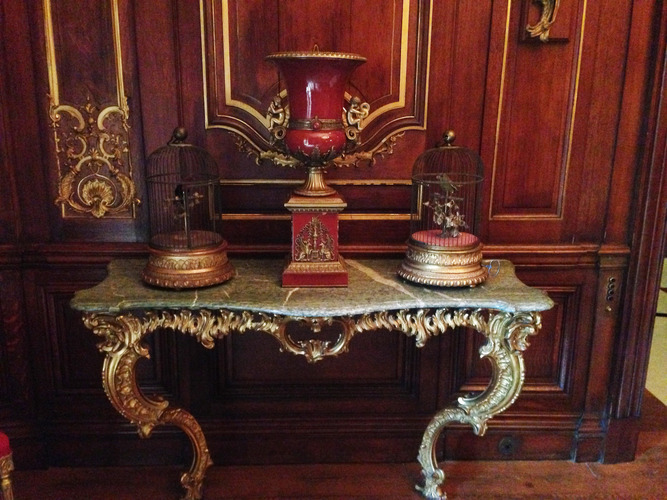 Admired and cherished and about to be housed and enjoyed within its new home for many years to come. 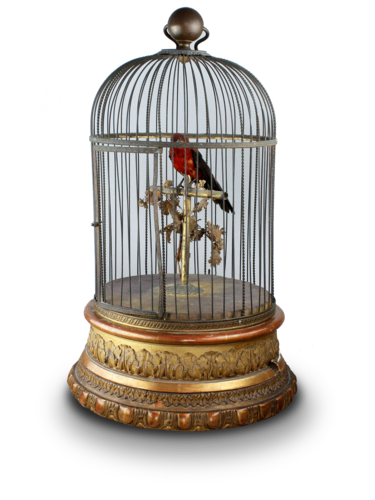 A superb example of what a Phalibois singing bird in cage should look like and sound.